To be honest, baking is not really my “thing.” Casey is much better at it than I am, and enjoys it more (I am more prone to random kitchen experiments and breakfast explorations). But Casey’s cookie brittle, along with the blog-world Christmas cookie take-over, had me itching to bake a mess of Christmas goodies. I planned to make gingerbread cookies, pistachio and cherry biscotti, and something minty and chocolatey last weekend. I even bought the ingredients. But then, Friday’s tragedy happened, and instead of spending Sunday in the kitchen baking up a storm, I spent it on the couch, snuggling close to my husband, for once not worrying about a to-do list but instead enjoying the comfort of the moment. I hope that you all have had a similar chance to hug your loved ones extra tight this week as we all struggle to comprehend the tragedy in Newtown. But last night, as I prepared to leave town and spend the holidays with family, I finally got around to making cookies! I’ll be sharing these with one of my best friends today when we meet up for lunch, and with my husband’s family when we arrive at their house tonight. These crunchy on the outside, chewy in the middle little cookies include not one, not two, but three types of ginger (ground, freshly minced, and crystallized)! I can’t use crystalized ginger without thinking of our dad… One year we were making something that called for crystalized ginger. We sent my dad to the store to pick up a few things, and asked him to get the ginger. When he returned home, he was beaming from ear to ear, carrying a 3 pound bag of crystalized ginger he had personally scooped from the bulk bins. But I digress… back to the cookies! Preheat to 350°. Line 2 baking sheets with parchment paper. Whisk flour, ground ginger, baking soda, cinnamon, cloves, salt, and pepper in a medium bowl. Using an electric mixer on medium-high speed, beat brown sugar and coconut oil in a large bowl, about 3 minutes (this will not get fluffy like it would with refined sugar and butter). Reduce mixer speed to low. Add egg, molasses, grated ginger, and vanilla; beat just to blend. Add flour mixture; beat on low speed just to blend. Mix in crystallized ginger (dough will be soft and sticky). Can be made 3 days ahead. Store airtight at room temperature between sheets of parchment or waxed paper. These cookies are absolute perfection. So much ginger flavor, such a great texture, and, thanks to the blackstrap molasses, they are somewhat healthy (blackstrap molasses is very high in iron. Read more about its nutritional benefits on Gena’s blog). I enjoyed my cookies last night with a glass of eggnog, my indulgence of the week (eggnog as coffee creamer = fabulous). Change the rain that was pounding on the roof to snow, add a gently roaring fire, and it would have been the perfect Christmas-time evening. But even without the snow and the fire, the cookies and eggnog have me feeling much more in the holiday spirit. We will be taking a break from the blog over the holidays. You can follow me on instagram (@lindzjane115) for photographic evidence of my holiday eats and adventures. Before we go, however, it’s time to announce the winner of the Awesome Bars Giveaway! 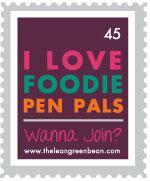 Congratulations to Val, my Foodie Pen Pal from October!! See you back here in 2013.